A culture of encounter is one in which we seek opportunities to fulfill the question of the scribe in Luke 10:29, “Who is my neighbor?” What can we do to be Christ to our neighbor? In the context of the World Day of Communications, the Holy Father considers how the various kinds of communications can aid in this “neighborliness”. As in previous messages by his predeccesors, the Holy Father says modern media, including social media, can be both good and bad, with promise and drawbacks. Among the drawbacks is the speed with which information spreads and how little time is afforded for people to stop, consider, and think before they’re bombarded by the next bit of information. We see that in the reactions to the various messages and interviews of the Holy Father, how quickly the long knives have come out and the doubters have attacked. He also notes that the vast variety of opinions and sources of information, while democratizing communications, can also lead to confirmation bias. So how are we to respond in the face of these pitfalls? With deliberateness and calm, time and silence, listening and patience. “People only express themselves fully when they are not merely tolerated, but know that they are truly accepted.” How often have I been in a conversation with someone else, barely listening to what they’re saying because I’m already formulating my response, waiting for them to pause so I can launch my next salvo? Is that communication that honors the root of the word: communion, community, fellowship, sharing in common? Or is it merely debating in order to win? Instead, in a communication at the service of a culture of encounter, we listen, we are attentive to the other, we want to know the other, we are interested in the other as a person. 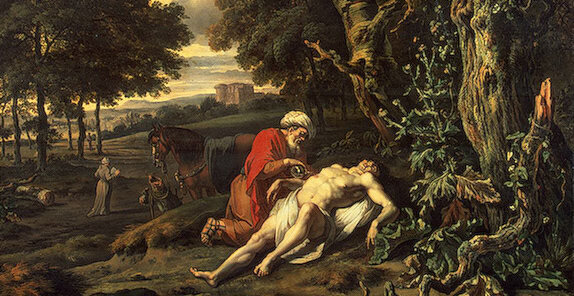 Pope Francis offers the Parable of the Good Samaritan as an example of this kind of communication. Those who communicate, in effect, become neighbours. The Good Samaritan not only draws nearer to the man he finds half dead on the side of the road; he takes responsibility for him. Jesus shifts our understanding: it is not just about seeing the other as someone like myself, but of the ability to make myself like the other. This is what I was saying, albeit in a poorer form, in my recent blog post “Catholic social media isn’t really media at all”. The important part of the term “social media” is “social” because what’s important in Catholic social media is the relationship among persons. The Christian faith isn’t mere content. It isn’t even just the message, the deposit of faith. If that were so, all we’d need is a book and we could go off alone into our room to be Christian. The essence of the Christian faith is relationship, a relationship with God in Three Persons and a relationship with our brothers and sisters in the world. We must know our faith, yes, but we must live our faith and share it too. But for those relationships to work, they must be reciprocal. There must be a willingness to speak and to listen on both sides. All media must be at the service of bringing people together in relationship. The Holy Father also continues his teaching on the need for the Church to be present in the streets, not just simply as a megaphone for Christian messages, but by entering into a conversation that addresses people’s concerns, their questions, and their lives. One line that is sure to cause some consternation involves the importance of dialogue. The Holy Father is not rejecting the reality of objective truth, nor is he saying that Catholic doctrine is any way negotiable. He is simply acknowledging the long-held understanding that truth subsists in its fullness in the Catholic Church, but that elements of the truth can be found in many places. For instance, perhaps there is value in considering a way of prayer or a form of evangelization or even the reverence for Scripture found in certain Christian churches and ecclesial communities. In the end, the Holy Father calls us to a kind of presence in the media that we know we should be providing: “Let our communication be a balm which relieves pain and a fine wine which gladdens hearts.” It’s left for us to consider whether our communications online and in other media do just that. Great post! I agree that the pope isn’t rejecting the reality of objective truth but seems to be saying that we realize it fully only in encounter and dialogue with those on the periphery of society. We need to humbly bring to those encounters our Church’s rich history of scholarship and prayer. Good article on catholic social media. I am developing a social network specifically for the diocese of San Bernardino, CA region. My purpose is to have a god and church centered face-book style alternative which features resources for catholic churches in the diocese. We specifically chose to keep the size of the site smaller to keep the content personalized and relevant to the region. Our site, http://www.deigratia.org is in beta and I would love for catholics in the region to use it, hopefully providing suggestions and feedback to improve it. Thanks for this post, Dominic. As a single mom of five boys, I felt very isolated by the Catholic church that I love when my husband left suddenly. Reaching out to others is so important when we are losing Catholics to other faiths and even worse to secularism. Thank you for explaining more about the social aspect of social media.